Last week, the biggest news was the continued lack of global inflationary pressures. The US’ core PPI was 1.4% Y/Y while the core CPI printed at 1.7% for the same period. Germany’s WPI was .4% M/M, Italy’s was .2% M/M and .7% Y/Y while Spain’s was .3% Y/Y. UK inflation dropped a bit, with core CPI coming in at 1.7% Y/Y and core PPI coming in at 1% Y/Y. The sum total of all this news is central banks in the US, EU and UK have nothing to worry about from inflationary pressures. Should each bank want to continue their policy of low interest rates, they certainly can. Weekly Indicators are up over at XE.com. Remember the polar vortex from last week? It seems to have kept consumers indoors and freight from moving. I discuss this morning's report on housing permits and starts over at XE.com. Both of these series continue their deceleration and are on the verge of turning negative YoY. Two signifiant arguments contra my contention that housing demand will actually decrease at least for awhile YoY this year are that (1) there is a lot of pent-up demand, and (2) interest rates at 3% are still low so there shouldn't be that much of a reaction. Fair points. But this isn't the first time that there has been pent-up demand for housing in an era of low interest rates. 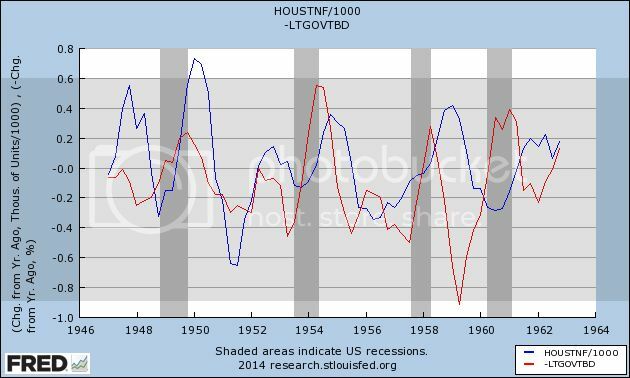 While the statistical series aren't identical, they clearly show that there was a huge housing bust during the Great Depresssion, that lasted through World War 2. Then all the GI's came home in 1945 and got busy making babies. Boom! 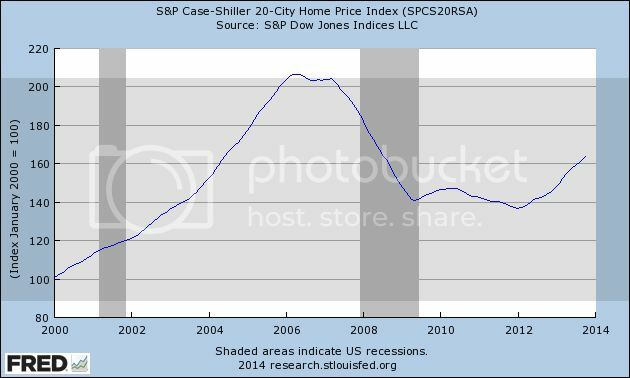 The argument against my bearishness is that minor changes in interest rates won't result in major changes in housing demand. But in the post-WW2 suburban Baby Boom era, far from being muted, the changes were magnified. 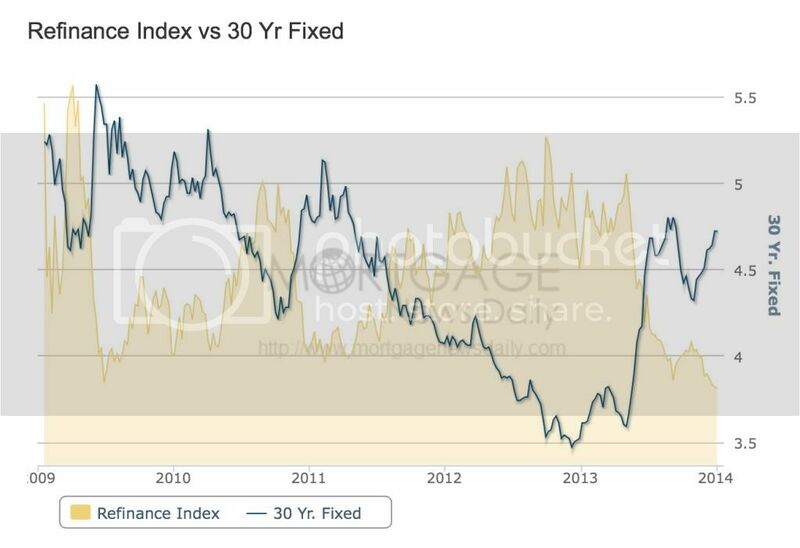 A change of as little as 0.2% in interest rates was associated with changes of 200,000 or more in housing starts. 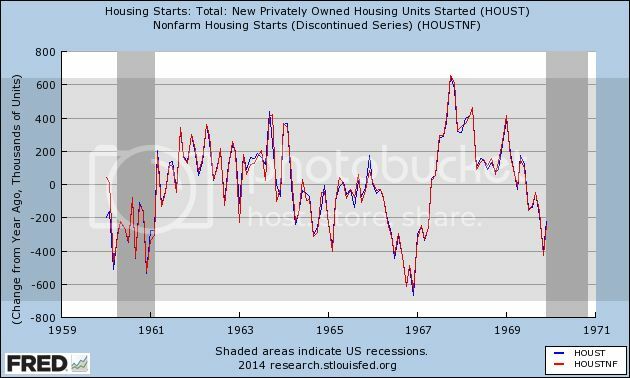 On 5 of the 6 occasions from 1946 through 1962 that interest rates increased YoY, housing starts fell YoY, in each case by at least 100,000 units annualized (even in 1962, several months were negative YoY, although no quarter was). Previously I've shown that on 12 of 15 occasions since 1962 when interest rates have gone up by 1% YoY, housing permits have fallen by -100,000 or more. 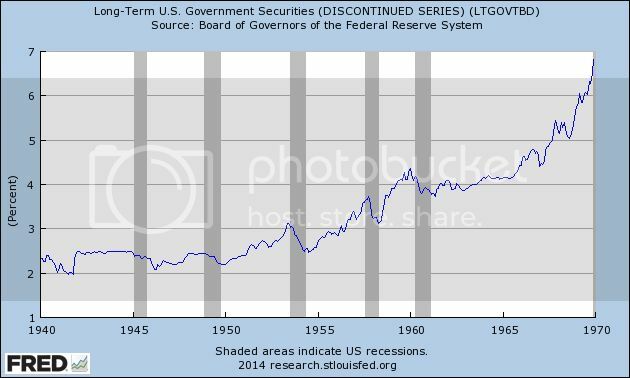 This data makes the total 17 of 21 times over almost 70 years, and even with interest rates rising by less than 1%. So, could it be different this time? Certainly. But what we can say is that the last time, like this time, that it was "different this time" because of pent-up demand and low interest rates, it turned out that it actually wasn't "different this time." Thus, while we can quarrel about the reasons, the fact that the unemployment rate has continued to drop sharply over the last year, following the trend in initial claims, was not unexpected. 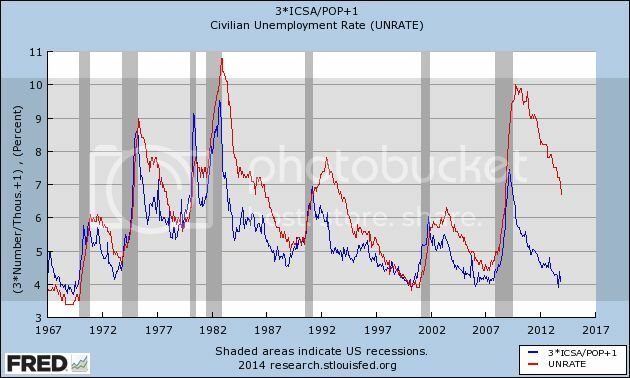 With initial claims near historical lows as a share of population, the issue becomes whetherr the unemployment rate can fall much below 6%, or whether the gap that opened up in 2009 will ultimately be closed. I anticipate that the unemployment rate will continue to fall, perhaps at a somewhat slower rate, to about 6%, but have a very difficult time declining meaningfully below that level. 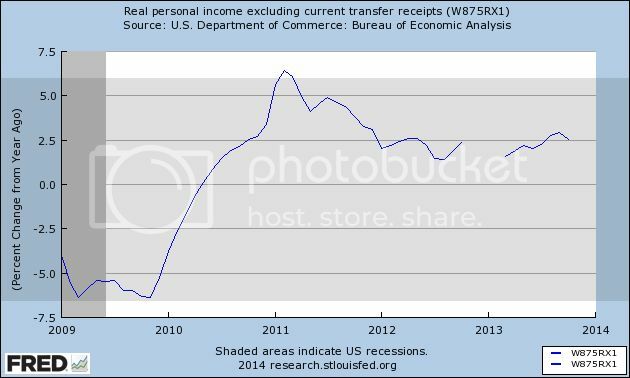 There is no "falling rate of personal consumption growth"
The blog is a good and respectable source of information, but in this case, I think they made a mistake. The entire "decline" for 2013 is contained in last month's data, and there's a very good reason why that happened. Notice the huge spike upward in November and December 2012, and similar spike downward in January 2013. 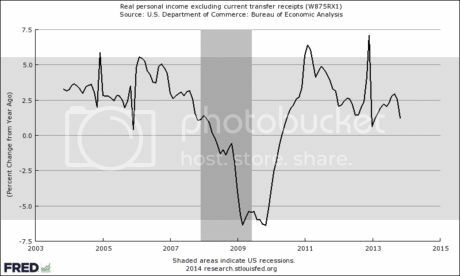 That's because of moving taxable income forward from 2012 to 2013 due to the higher tax rates that were anticipated due to the "fiscal cliff" expiration of the Bush tax cuts at the end of 2012. So the November 2013 - January 2014 YoY comparisons now will be between "regular" monthly changes now vs. the very volatile changes of one year ago. Flat. 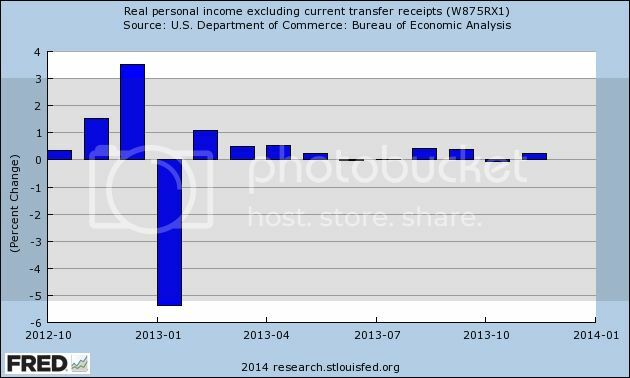 There is no "falling rate of personal consumption growth." Not that Zero Hedge won't have an article trumpeting the alleged downturn when the December comparisons come out at the end of this month. Or that they won't be completely silent about YoY January comparisons too. 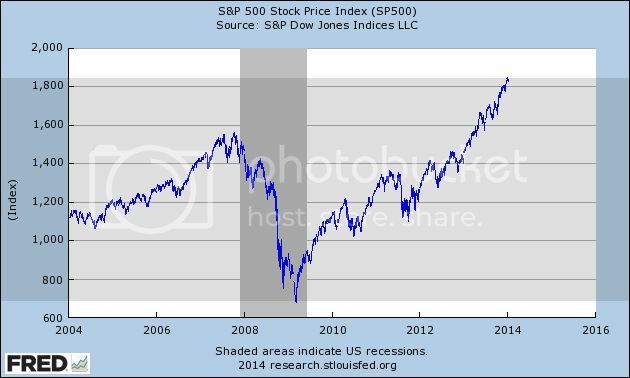 The correlation between stock prices and interest rates has completely changed for the last 15 years, compared with the previous 40 years. I have a new post up at XE.com explaining how and why. The state of the consumer: "I'm not dead yet!" Like the character in the "Bring out your dead!" Monty Python skit, the American consumer keeps protesting that s/he isn't dead yet. 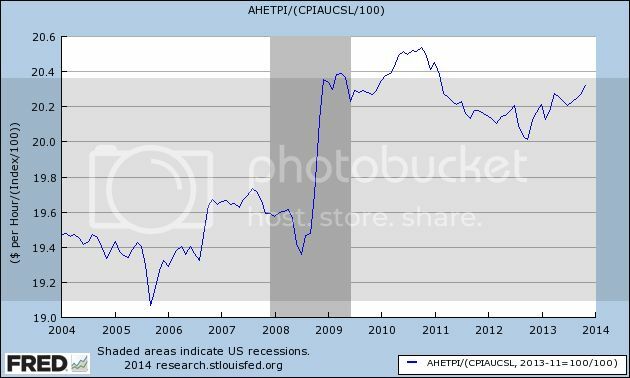 So why, given wages that are several percent below their 2010 peak, do consumers keep spending? 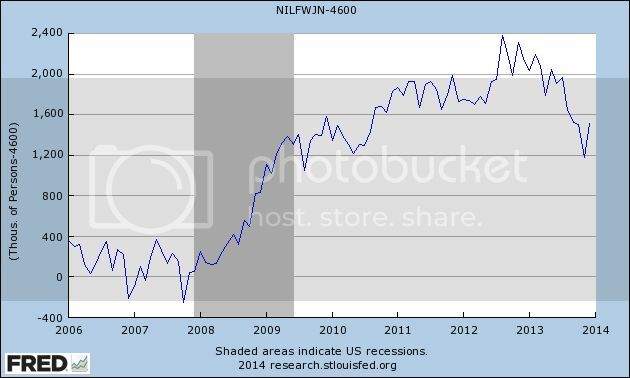 We know that there is a wealth effect, and for now the wealth effect is picking up where debt refinancing left off. Notice the spike downward in the last 6 months. 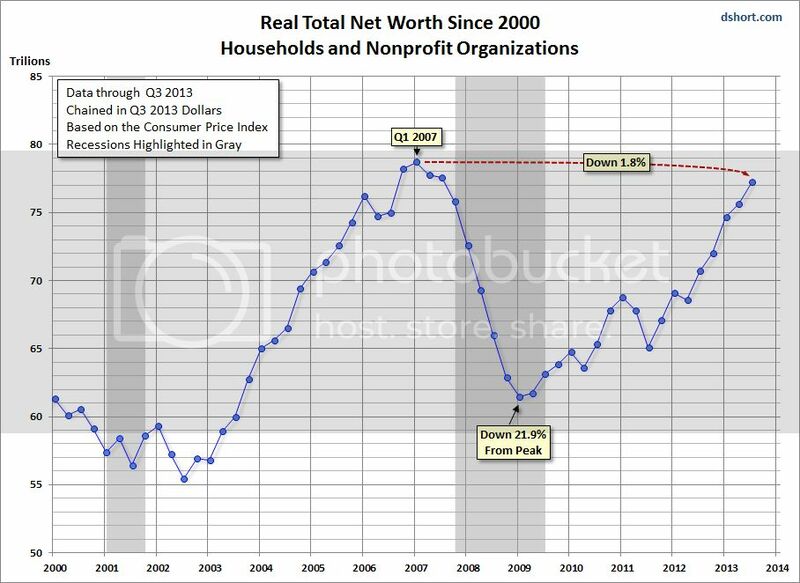 I do not think it is coincidental that it mirrors the graph of household worth above. The Altnata Fed has reported that in the last couple of years the percentage of those leaving the workforce due to retirements has increased, and I suspect that the recent spike in net worth has caused a stampede of Boomers for the exits. Even if we believe that equality of opportunity is what we want, and don't care about inequality of outcomes, the two tend to go together, which suggests that inequality itself is a barrier to equal opportunity. To worry about these consequences of extreme inequality has nothing to do with being envious of the rich and everything to do with the fear that rapidly growing top incomes are a threat to the wellbeing of everyone else. I beg to differ. The Pareto principle is an extremely conservative restriction that entrenches existing inequalities of power and wealth in place, virtually in perpetuity. Americans think the top 20% owns about 55% of the wealth. They think a fair distribution would be for the top 20% to own 33% of the wealth. In fact, the top 20% owns about 82% of all the wealth in the US, and the bottom 60% own only 4% of the wealth (and the breakdown only gets more lopsided when we consider the top 5%, top 0.5%, and top 0.05%). So, let us say that we democratically as a society decide that equality of opportunity should result in our fair wealth distribution as described above, and so we enact frictionless and fair policies, consistent with the Pareto principle, to move to the wealth distribution that Americans say would be fair now. How long would it take to get there? When would we arrive? Under the Pareto principle, we cannot redistribute existing wealth, since doing so would make those from whom it is redistributed worse off. We can try to get around this two ways: the first is, we only pass policies to ensure that future economic growth winds up being allocated, after taxes, in the distribution we have chosen as fair, or some facsimile thereof. The only way to get to 33% via future policies is to ensure that, for some period of time, the top 20% accumulate less than 33% of the new wealth, which we already have agreed is unfair, since we have agreed that they should have 33% of the wealth. Needless to say, if our policies are far more incremental, which is of course far more likely, then we never even get close. But wait, you say, people die. We simply change our estate tax laws to approximate what they were back in the 1930s, and prevent the transfer of $Billions to succeeding generations of heirs. There are several problems with this. The first is that, depending on how the tax laws are written, it will take decades to lifetimes to come to fruition. The second is the objection that existing plutocrats derive pleasure from the fact that they can dispose of their wealth, upon their death, as they see fit, and if that means ensuring that their heirs out unto the generations remain among the plutocrats, that is their right. If we interfere with that, we are making them very sad. The Pareto principle is violated. The bottom line is, any choice by society to enact policies to move away from an existing distribution of wealth - even, let me emphasize, unearned, inherited wealth - violates the Pareto principle. If Prof. Garcia's and DeLong's critique of inequality is correct, then surely it should not take a lifetime of resolute effort to approach a fairer result, and in fact the Pareto principle does not even permit that. The Pareto principle entrenches plutocracy. UPDATE; Just to be clear that this is not just about envying wealth, let's consider in our land of unicorns and rainbows that we have had a Rawlsian conference in which we have agreed to relentlessly enforce equality of opportunity. We then have a 10,000 year test run in which we reord the resulting distribution of wealth, which I'll call summation X. We now go back into real history where we already have not had equality of opportunity, and we have any existing, different distribution of wealth. The Pareto priniple forbids us from ever arriving at summation X. A certain amount of wealth and assets can never be owned by those who should otherwise own them by dint of their efforts under conditions of equality of opporltunity. Why should we give our allegiance to such a principle? P.S. : My primary solution to the above is to ignore the claimed utility as to heirs not yet in existence. I have no problem with Bill Gates or Henry Ford passing on their wealth, minus a reasonable tax rate, to their children or grandchildren. But by the time we get to great great grandchildren, inherited wealth should be taxed at confiscatory rates, e.g.,90%. I would only apply this to that portion of wealth that is inherited. 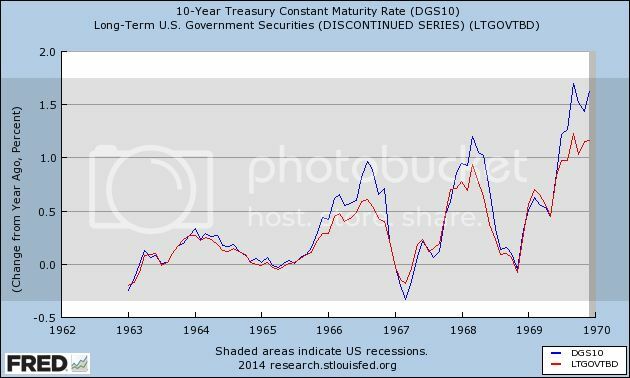 If granddad leaves me $100 million, and by dint of acumen and industry I turn that into $1 Billion (after inflation) by the time of my death, only the inherited portion, i.e., the first $100 million, should be subject to the confiscatory rates.